Many traders use only one time frame. 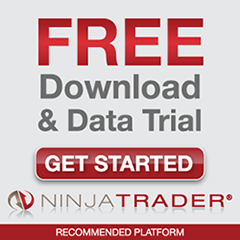 Whether it’s a time chart, tick, range or renko, those traders are trading with blinders. All markets are multidimensional, meaning that different time frames are each telling you different information. You wouldn’t make an important decision about anything by looking at only one piece of information when there’s a whole trove of information out there. So, why would anyone want to trade that way? The answer is: you don’t. If you see a great setup on a large time frame, how would you know precisely when to enter? If you’re just using that large time frame, there is no way to pinpoint a precise entry. It’s like trading with a chainsaw. The solution is to look at smaller timeframes, where you can trade with a scalpel. Let’s look at an example. The following 6E 1597 tick chart from today shows a HyperSnapback Down at 7:18 am PDT. Click the chart to enlarge it. At that time (7:18), the 6E was heading up at a fairly solid pace. Even though the reliable HyperSnapback indicator (bottom of the chart) shows a setup to go short (red diamond above the yellow line), it is wise to check lower timeframes to pinpoint the entry. Let’s drop down to a 10 minute chart. Click the chart to enlarge it. As you can see on the 10 minute chart, we also have a HyperSnapback Down, at 7:20. Given the confluence of the two HyperSnapbacks Down, 1597 tick and 10 minute, we have a high percentage move to go short. The precise entry would be when the trend line (blue/magenta line) turns magenta. Allowing for some slippage, you’re in at 1.0890. Since the Momentum Band has remained red, you’re still in the trade at 1.0852. Nice trade! 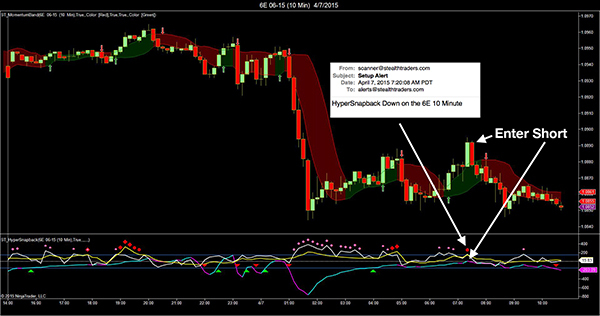 Another way to manage the trade would be to exit as price started to pull back up around 8:50. Still a nice trade. And, you could reenter off the SnpabBack Down (pink dot above the white line) at 9:20! When determining when to enter a trade, use all available evidence to pinpoint the trade and make sure it’s high percentage. The best way to accomplish this is by using multiple time frames. This is how we trade at Stealth Traders, with precision on high percentage moves. 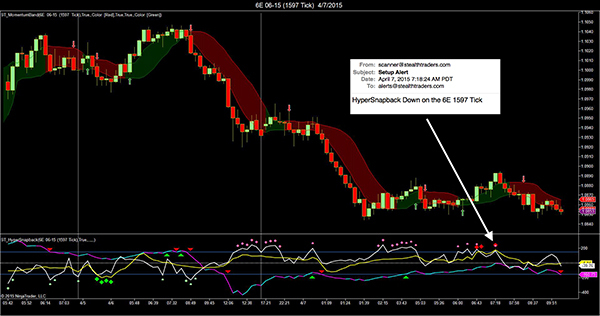 If you’d like to trade this way, we encourage you to attend our free webinars. The only thing you have to lose are bad trading habits.